Get MBOX Viewer Absolutely FREE with MBOX to PST Converter. MBOX to Outlook Exporter tool is developed to transfer 20+ email clients MBOX mailbox files to PST of Outlook. Download free demo version of MBOX Converter utility to easily move inbox.mbox, drafts.mbox, etc. to MS Outlook PST file format. MBOX to Outlook PST Converter software is an effective tool to migrate multiple MBOX files to PST format in bulk. The output UNICODE PST file is compatible with all Outlook versions including 2019, 2016, 2013, 2010, 2007 and 2003. 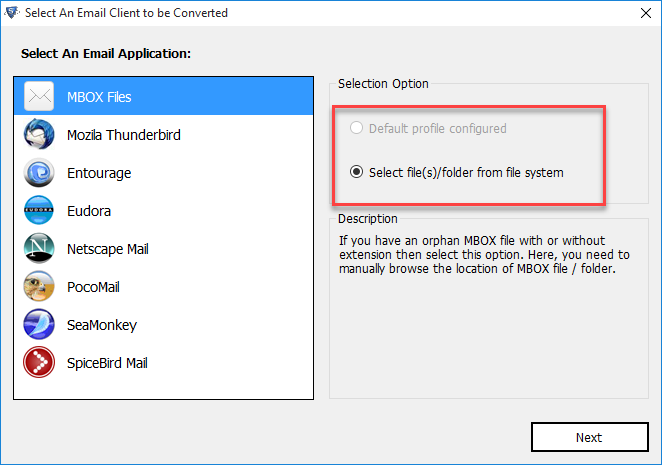 You can import several MBOX data files from within a folder for batch conversion. The tool is also capable of recovering deleted emails from MBOX. The software can easily auto-detect multiple MBOX supporting email clients installed on the local system. These are namely Mozilla Thunderbird, Entourage, Eudora, Netscape Mail, PocoMail, SeaMonkey and SpiceBird Mail. You can just choose the email client from within the tool's interface instead of manually locating their data files. 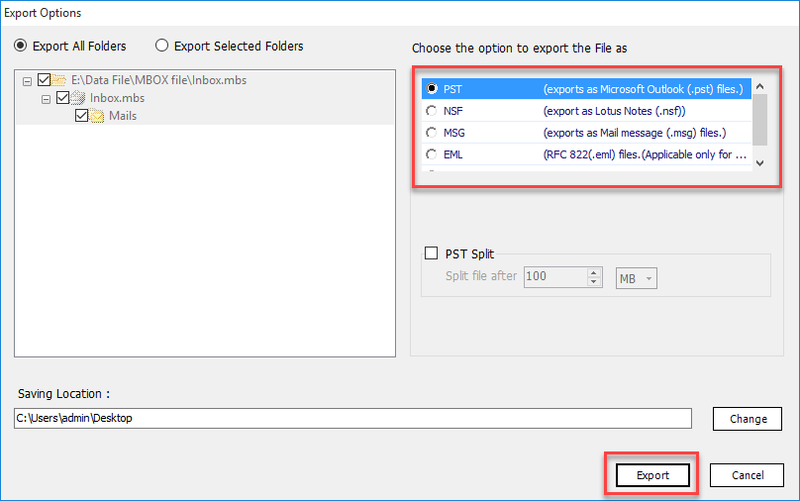 This MBOX to Outlook utility gives two options to save PST file: Either a single .pst for all MBOX files will be created or for every MBOX file a separate PST file can be created. Any convenient option can be chosen. The application offers migration of MBOX file type backup of Gmail emails from Google Takeout directly into PST format. There are no issues of data loss throughout the conversion process. 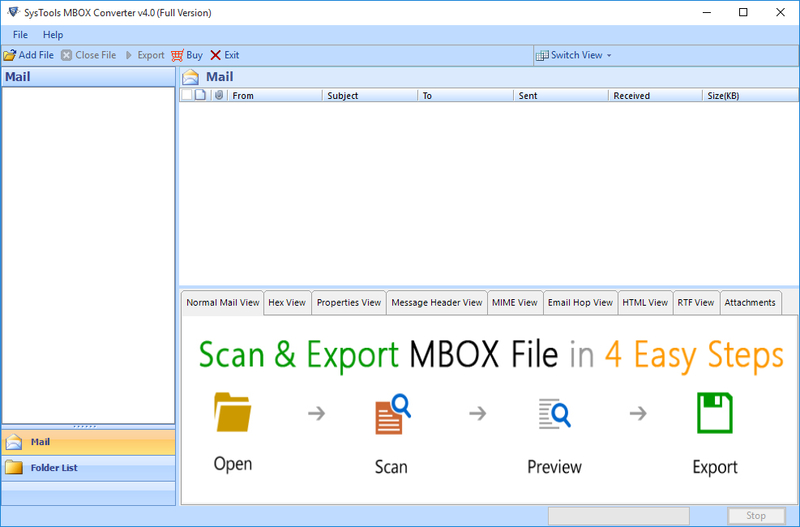 Before migration, MBOX Converter gives a preview of MBOX file emails and their attachments within the software panel. Email and Attachments View section of the tool provides a total of eight different options to view the MBOX file data. A detailed report of the entire email transfer is also generated automatically by the software. MBOX is the most common file format used by multiple email clients. Around 20+ email applications stores data in different variations of MBOX such as .mbox, .mbx and MBOX file without any extension. The software can easily export all data from all these file variations without any issues. The MBOX to PST exporter is capable to scan, filter and search MBOX files amongst different types of files within the storage folder. 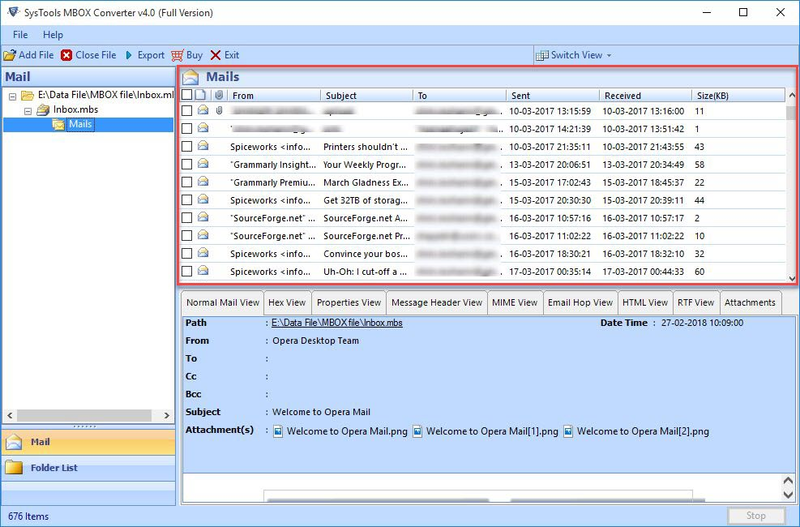 It can easily select multiple MBOX from an assorted array of files and extract all their emails along with attachments. There is absolutely no need to install or configure Microsoft Outlook on the system even if the output is generated in PST format. It is free from any sort of dependency issues and can export multiple MBOX files without the need of Outlook client. MBOX to PST Migration tool provides an additional option of splitting the output PST file during the conversion process. This split option enables you to divide your resultant PST file data by desired size in GB or MB. MBOX to Outlook Exporter tool is a Windows OS based software that supports all its available versions. The tool extends its support to both 32-bit and 64-bit versions of the Windows OS. The MBOX Converter software is also available as a Freeware trial edition. It previews all the Emails & Exports 25 MBOX items/folder to PST, EML, MSG,or NSF for demonstration purpose. What are the striking features of the MBOX Converter tool? Is it possible to move MBOX into PST without MS Outlook installed? Yes, MBOX to PST converter does not require installation of any MS Outlook application to perform the migration of MBOX files to Outlook, EML or MSG file format. Can I also recover and export permanently deleted emails from the MBOX file? I had deleted some mails accidentally, would it be possible to restore MBOX data back? 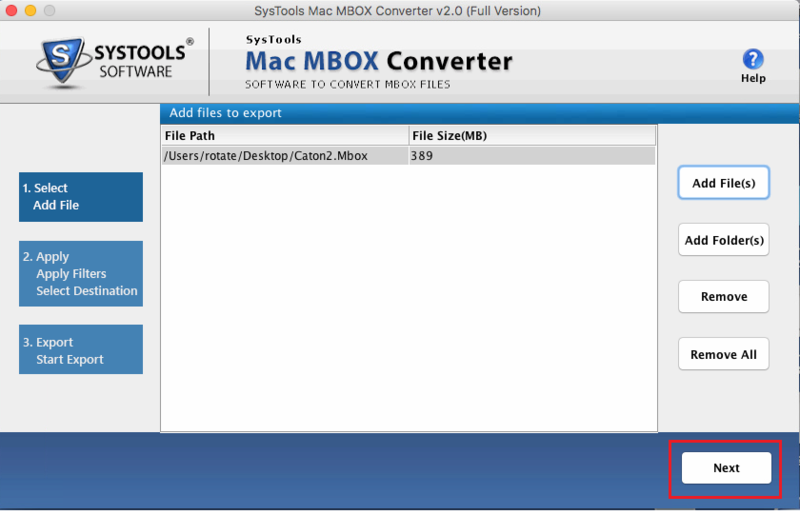 Yes, the MBOX Converter tool easily recovers deleted data from your MBOX data file while exporting them to chosen format. Can I use this tool on my new Windows 10 64-bit machine? Yes, the MBOX to Outlook converter supports all Windows OS versions. It runs smoothly with both 32-bit as well as 64-bit Windows OS as well. Could not start moving process when running MBOX File Exporter. How can I solve this issue? Please disable the Anti-virus while running the MBOX to PST transfer utility. You can include the Application in Whitelist or allow access to the MBOX Converter software from Anti-Virus Settings & the tool will start working smoothly. Is there any kind of file size limitation for MBOX file conversion in the software? No, MBOX to PST converter does not impose any file size limitation. You can export MBOX files of any size. In addition you can choose to split any large size file during the migration process. MBOX to Outlook Converter is truly a powerful tool to import MBOX files to Outlook PST. When I was struck with urgent requirement to shift bulk emails from multiple MBOX to PST, the software helped me effectively. The quick and relevant conversion of the tool is amazing. Thanks for formulation of such brilliant application to extract MBOX emails to Outlook. Excellent Tool for moving MBOX files to PST and accessing them in Outlook. The availability for both Mac & Windows platforms makes MBOX Exporter special as I can use the tool on both platforms. Recommended utility for MBOX files transfer in simple steps. Thanks to the developer. 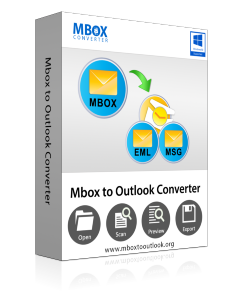 I am glad to have chosen this MBOX Converter to transfer all emails from MBOX to PST. This SysTools product did a flawless job in moving around 50 employees MBOX data to Outlook without any data loss. The tool is easy to work with and generates effective results in just a few clicks. Mac MBOX to Outlook Migrator Software transfers multiple Mac MBOX emails to PST file format. 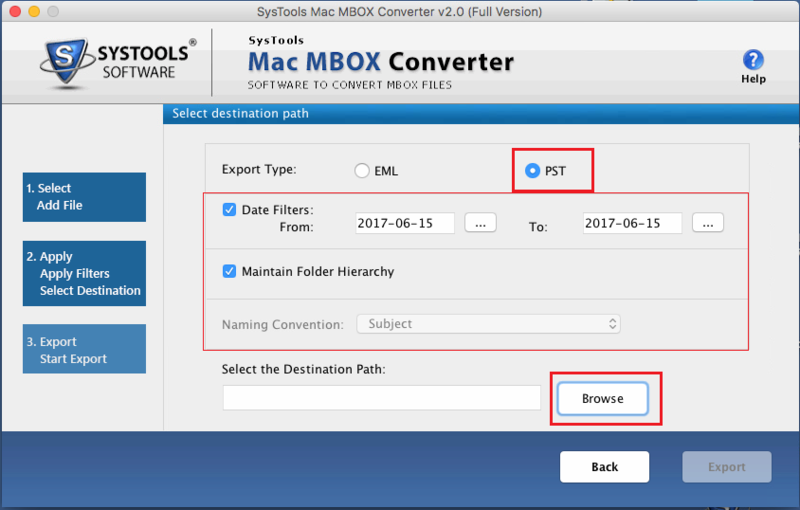 Download free trial of Mac MBOX exporter tool to easily move MBOX database files to PST Outlook format on Mac OS platform. 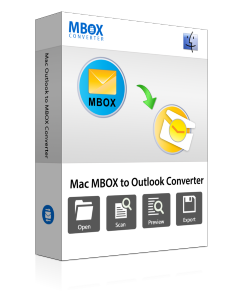 Mac MBOX to Outlook Converter is capable to export multiple Mac MBOX files to PST format. It automatically scans and loads the MBOX file(s) as well as can extract all its data into Outlook PST format. You can choose to import files as well as folder when using the Mac MBOX Converter software. Mac MBOX transfer utility can also convert all emails from MBOX file to Hypertext MarkUp Language. It creates separate HTML files for all the selected emails. The tool generates the HTML code for the emails easily and the output files can be opened in any browser. The utility allows migration of multiple Mac MBOX file. It creates a single folder for all Mac MBOX files. However, it also lets you create a separate folder for each MBOX file by selecting the "Separate Folder" option. Mac MBOX Migrator maintains the original HTML formatting, folder structure as well as inline attachments associated with the emails during exporting from MBOX to EML/PST. Mac MBOX Converter provides option to name the output emails while moving from MBOX to HTML format. Naming Conventions helps in locating the converted emails easily. By using the inbuilt Date Filter of Mac MBOX converter, users can easily export and arrange their emails as per the date specified in the filter input. The software ensures exporting emails with their properties retained. Emails comprises of message properties that include different information like attachments, header information and attributes such as cc, bcc, etc. Mac MBOX To PST Migrator supports all the latest versions of the Mac OS including Mac OS X 10.10, 10.11, macOS 10.12 and 10.13 and it can be installed easily using the installation wizard. The Mac MBOX to PST transfer utility for Mac is available as a freeware trial edition that can export 25 MBOX mails to PST for demonstration purpose. Does the tool to convert MBOX emails to PST work with MAC OSX 10.9 & lower versions? No, MBOX to Outlook transfer software only supports Mac OSX 10.10 & all above versions. It will not work with lower versions. Can the software export large number of emails in one time from Mac MBOX to PST? Yes, Mac MBOX Converter can easily move multiple emails from Mac MBOX files to PST format. You can simple browse the files and convert them all collectively in one go. Does the tool support migration of Windows origin MBOX files to PST on Mac OS platform? 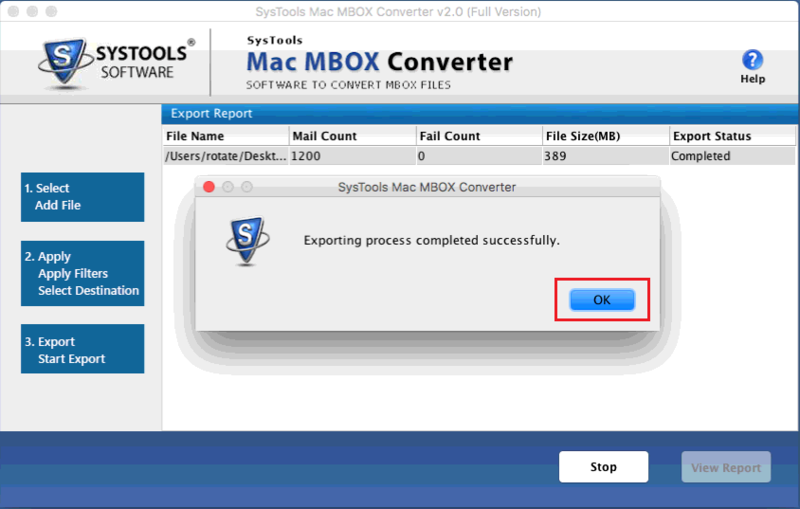 Yes, the MBOX Exporter tool for Mac can easily convert any MBOX file no matter on which platform they were created. In what formats does the software convert the mailbox files? Does it support MSG as export type too? The Mac MBOX migration wizard only convert emails to PST, EML, PDF, and HTML formats. MBOX Migrator for Mac is certainly an extremely effective application with lots of relevant features. Nothing is more important to me than my old emails and so I couldn't risk any kind of data loss issues. This software performed like a pro and I was easily able to transfer all my emails from MBOX to PST without any damage. Many thanks to this wonderful utility for helping me to access all my data in Outlook. Perfect combination of simplicity and performance. I needed to access my Mac MBOX files data on Windows platform urgently. And with Mac MBOX to Outlook Converter, I was easily able to export my multiple MBOX files to Outlook PST in no time. Thanks to the developers for saving me a lot of time and effort. Best software for Mac OS to convert MBOX emails into PST, EML, PDF and HTML format. It was a delight to work with this MBOX Converter for Mac when moving my mailbox data to Outlook. It also helped me attach some important mails as PDF in my presentation. Wonderful application with amazing features available at best price.